I was encouraged to read this book by my trusted Graham Crackers comic book store staff. Their synopsis: what if a black Superman landed in the segregated South during the 1920’s? They have never steered me wrong with my purchases, and I was intrigued at how a superhero origin story could be upended by racism. In fact the title of the book is based off the song made famous by Billie Holiday, Strange Fruit, which is about lynchings and bigotry (video link below). This magical realism tale is based off the historical 1927 flooding that affected many towns in the South along rivers. Blacks were disproportionately forced to shore up the crumbling levies, and were the ones whose poor land was most often affected the worst when natural catastrophe hit (as the Lower Ninth Ward in New Orleans was hit hardest by Hurricane Katrina in 2005). As the threat of disaster looms in this story, and racial tensions are mounting, an explosion occurs nearby. An alien ship has crash landed and out climbs a naked black man, whose ship disappears into the river muck. Mute, he is confused as to why white men dressed in their KKK regalia attack him. 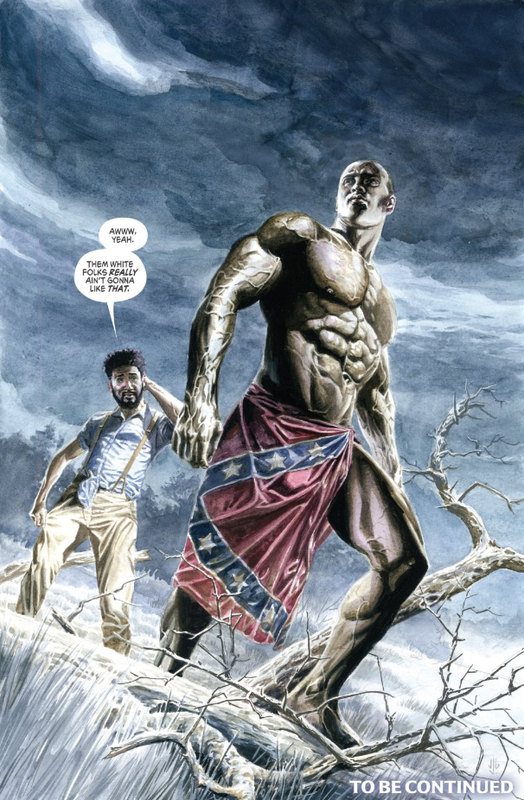 Another black man grabs the Confederate Battle Flag they dropped to wrap around our naked hero, who is sometimes referred to as Johnson (this refers to something he needs to cover) or Colossus. This covering courts controversy in town as he heads to the library to gain knowledge about this strange new planet. Just when political, social and racial tensions are reaching their breaking point, the levy also breaks, and his immense strength is utilized to help save the town. There is a rather grim conclusion, with no satisfying hero’s arc or hints of redemption available. The artwork is amazing. Reminiscent of Alex Ross’s artwork in Kingdom Come (that Mark Waid also wrote), JG Jones’s artwork is photo-realism in style, and cinematic in scope. The panels often look like they are painted movie stills, with incredibly realistic looking characters. I am reminded of Dorothea Lange’s photography work of the Depression-era poor when I see how some of the people and community are portrayed, and I’m sure photographs of that time period were utilized for research by the illustrator when creating this story. The hero’s depiction seemed a bit overdone at times, but the underlying sinister legacy of racism came through loud and clear. However, the narrative turned out to be problematic at times. On my first reading, I thought the story was powerful and thought provoking, and I loved the artwork. But when graphic novels are multi-layered like this one is, I like to read it a second time and ponder the message more deeply, so I can better pull my thoughts together. The two men who wrote and illustrated the story were raised in the South as boys but are white men. So the question is can white men properly depict what blacks experience, since they are not writing from an #ownvoices perspective? I recently took a graduate class on diversity in young adult literature, and that was a topic that came up again and again, as white privilege is a very real issue. The book did have a foreword written by Elvis Mitchell, a black film critic, which helped give it some credibility, and he brought up that this story helps raise awareness of race in comics. Created with the best of intentions, but imperfectly framed at times, I found this book provocative and well worth reading, even if it just raises more questions than it answers. If any one out there has read this book, I’d love to hear what your thoughts were after you read it. If you looked up “girl power” in the dictionary, the cover of this graphic novel is what would show up. The Lumberjanes are a group of five girls who are attending a summer camp modeled after Girl Scouts. They are a diverse group- with a nice representation of body types, clothing styles, age and sexuality. This is a magical realism tale, for the girls are immediately thrown into situations that have paranormal animals, and later they have an Indiana Jones type adventure. The girls aren’t fazed by any of it, although their older cabin leader doesn’t ever seem to see any of the creatures the girls do. But then there is the hip, tattooed camp director who seemed to be in on the mysteries. Two of the five girls are a couple, and one girl seems gender fluid, but none of it is over emphasized. Instead it’s just a group of friends who work well together and always have each others back. Isn’t that we all should have in a friend group? The only complaint I have is that sometimes the dialogue is trying too hard. The girls love to throw famous people into their conversations as slang words- “What in the Joan Jett are you doing” and ” Good Juliette Gordon Low, we’re allowed to have something good happen once in awhile”. It was funny once, but then becomes too trite. The author and co-creator of this story is Noelle Stevenson, who also wrote and illustrated the appealing Nimona. When I first read Nimona, Stevenson’s artwork was new to me. But as I have read more graphic novels in the last few years, I have noticed this cartoony hipster style is similar to the art work of Faith Erin Hicks, Emily Carroll and Molly Osertag. Although the illustrations are credited to Brooke Allen, the characters are so very Stevenson, that I’m thinking Allen had to draw based off the template that Stevenson designed. But the bold bright colors with a modern look will be a draw for young readers. And that’s why I picked it to read with the middle schoolers at my library for our next graphic novels book club. The story ends on a cliff hanger, and I and other readers will definitely want to read the next in the series to find out what adventures the Lumberjanes get into next! Stevenson, Noelle, Grace Ellis, Shannon Watters & Brooke Allen. Lumberjanes: Beware The Kitten Holy. 2015.